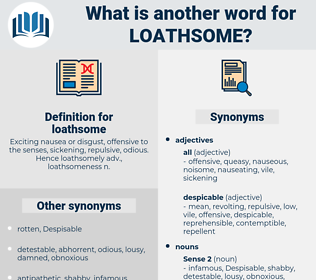 What is another word for loathsome? Exciting nausea or disgust, offensive to the senses, sickening, repulsive, odious. Hence loathsomely adv., loathsomeness n.
heinous, disgusting, odious, abhorrent, detestable, despicable, repugnant, vile. repellent, reprehensible, disgraceful, unsavoury, terrible, invidious, filthy, horrifying, obscene, unspeakable, infamous, egregious, unpleasant, evil. abominable, hateful, repulsive, appalling, distasteful, revolting, hideous, obnoxious, sickening, horrendous, nasty, dreadful, deplorable, atrocious, horrible, horrific, monstrous, dastardly, vicious, outrageous, awful, foul, ugly. kind, pleasing, likeable, agreeable, good, liking, respectful, nice, pleasant, delightful, lovable. felicitous, delectable, innocuous, desirable, heavenly, blessed, enjoyable, acceptable, congenial, Delightsome, healthy, palatable, salubrious, healthful, dulcet, unexceptionable, restorative, satisfying, salutary, inviting, pleasurable, dreamy, gratifying, likable, unobjectionable, welcome. In the memory of her face, as in an impossible mirror, he saw a loathsome image of himself. The prospect of that journey to London was suddenly loathsome to him. lithesome, lidocaine, lutzen, latch on, lutecium, lodge in, ladies' man, ledgeman.